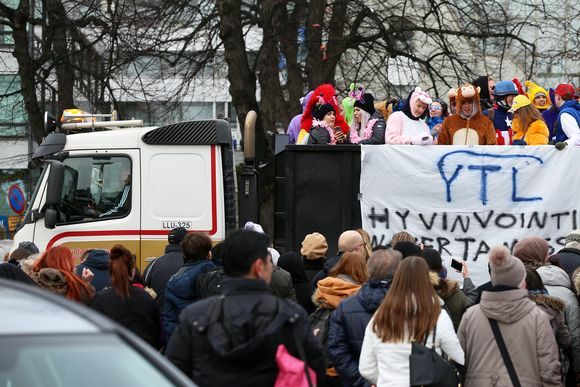 Upper secondary schools can now decide independently on the day they will hold "penkkarit", when truckloads of final-year students drive through the streets to celebrate their last day in the classroom. A reform of Finland's matriculation exams has moved the end of classroom instruction for last-year upper secondary school (high school or lukio) pupils up to the final week of January, ending the 100-year-old tradition of holding end-of-studies festivities in the second week of February in many schools. 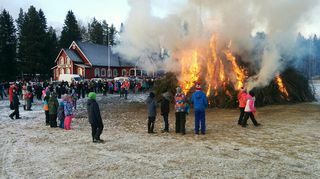 For example, final-year students at Nurmes Upper Secondary School in eastern Finland have decided to move their "penkkarit" up to 7 February this year. They will hold the school's "Old dances" (Vanhojen tanssit), a formal ball for second-year students to celebrate their new status as the oldest kids in the school, on 15 February. "Penkinpainajaiset", commonly known as "penkkarit", started in Finland with the spring exam-takers taking sleigh rides from their schools to a restaurant. In recent years, it has morphed into a parade of sorts, with truckloads of final-year kids in costumes riding through the streets in decorated lorries throwing candy and celebrating their "release from the school benches," which gives the event its Finnish name. The last of several reforms to Finland's laws on matriculation exams took effect this year. Among other changes, the reforms ended the practice of holding separate oral language exams in February. This now means that final-year classroom instruction ends in January. Since the 1920s, Finnish high schoolers have stopped attending classes early in the spring of their final year so they can devote themselves to solitary preparation for matriculation exams in March. Roosa Pajunen, chair of Finland's Union of Upper Secondary School Students, says she feels it's important for the schools to listen to students when planning the dates of these major milestones in the Finnish high school experience. She says her union doesn't have an official position on the matter yet, but she thinks that a statement or recommendation might be forthcoming. "The parades are an important celebration for the students, and they play a strong role in strengthening their school spirit and shared identity. If we could keep all the celebrations to the same day, it would make it a much more powerful and cohesive tradition," she said. "I would hope that if we can't decide on one day nationwide to hold these events, at least we would be able to agree on common dates for both the parade and dance within the same municipalities."